#Politeenquiries: Should Ashley Giles be judged on results? Ashley Giles has insisted he will not take his eyes off the long-term goals of the England team to aid his own short-term ambitions by treating the tour of the West Indies like a glorified job interview. 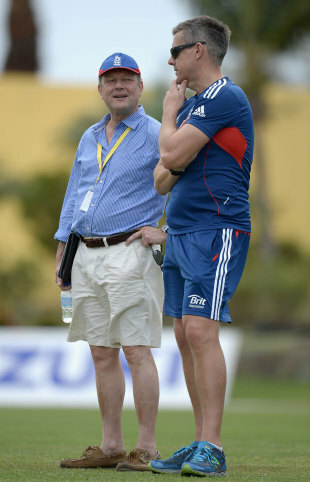 Giles has made no secret of his desire to be appointed England coach in all formats of the game. But he knows that the team's recent record - they slipped to their seventh defeat in nine ODIs in Antigua on Friday - is doing his case few favours. He hopes, however, that the ECB management and England supporters understand that the team is in a "development phase" and that the plans being put in place at present will bring long-term benefits. Giles has not been helped, in the short-term at least, by England's decision to go into the ODI series against West Indies with their T20 team. A lack of experience and composure were obvious in the first match, with England dominating for the first 35 overs of each innings, before squandering their position with poor late-order batting and wretched death bowling. But Giles hopes the experience of such matches will aid his side going into the World T20 in Bangladesh in a couple of weeks and feels it is essential England focus on the process of improvement rather than chasing results. "I can't coach and manage this side right now with the view of it being a job interview," Giles said. "I'm here to create the right environment and of course to win games of cricket for England. That's going to be a process as well. We are in a rebuilding and development phase. "If I was that concerned about results and this being my job interview, why wouldn't Anderson, Cook and Bell be here during this one-day series? This is about preparing this side as best we can for Bangladesh and the World T20." But Giles did admit that he was concerned that he might be judged harshly on results in Australia, in particular. An England side missing a host of senior players was beaten 4-1 in the ODIs and then 3-0 in the T20s leading Giles to remind supporters that, the last he had anything close from a full squad from which to select a side, England came within an ace of winning the Champions Trophy. "Being judged on results without having the best side available is a factor, yes," Giles said. "Of course I'm going to be judged. "But I have to try and concentrate on the job I'm doing here and I think I'm doing that pretty well. "I'm not going to change the way I go about things because of what people think. My job here is to create a culture, to create an environment, where these guys can learn and they can flourish, but at the same time is really challenging as well, because we are in the business of winning games of cricket. "We're always judged on those results, but as I've always done as a coach, it's about working from bottom-up. If you get the other stuff right first - environment and culture - then the outcome will take care of itself. "At the moment, I am the only England coach. I'm doing that job to the best of my abilities. Everyone will have a view about how good a coach I am or I am not. I just have to get on with my job, look after these guys and my management team and together we go forward and try and win games for England. Whether I get the job or not is in other peoples' hands." The England camp remain confident that both Alex Hales and Eoin Morgan - referred to by Giles as "one of the best one-day players in the world" - will have recovered ahead of the T20 games in Barbados, with Giles accepting that is was not their absence so much was some poor death bowling that cost England in the first ODI. He also hinted that, while Stuart Broad had done a fine job as captain in ODI cricket for the first time, that the decision not to bowl Ravi Bopara was a mistake. "For 35 overs with the ball, that was as good as I've seen us in my time," Giles said. "We probably played the best cricket for 70 or 80 overs of the game. It's disappointing to lose a game from there, but there's obvious areas where we need to improve. We got it wrong at various times with the bat and the ball. We can learn from the ways the West Indies did things at the back end of their innings and our innings. "I thought Broady captained the side really well. It's always easy in hindsight to think of a couple of things you'd like to do differently and bowling Ravi might have been one of them. It might be different tomorrow. "But I think our bowlers would be honest and admit that at the end of the innings, we didn't get our skills quite right. If you execute really well all the time, it's really difficult to score that amount of runs in the last 10 overs. If you don't then against good players you risk going out of the park."